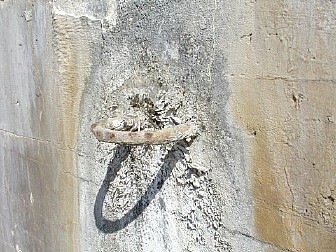 The water stains on the wall show how the drainage system no longer works, and water seeps down behind the wall. 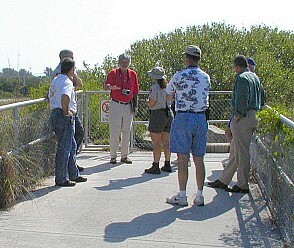 An architect who specializes in restorations, and a group made up of Park staff and Friends of Fort De Soto, study the problems that need to be overcome. The fort is suffering ongoing deterioration every time it rains. But it can be stopped. When you climb up the stairs to the walkaway across the top of the fort, you probably think you're standing on top of a whole lot of dirt which is piled on top of the fort. You're almost right, but not quite! Underneath the dirt, but on top of the fort, there is a complete drainage system--all part of the original fort's design. 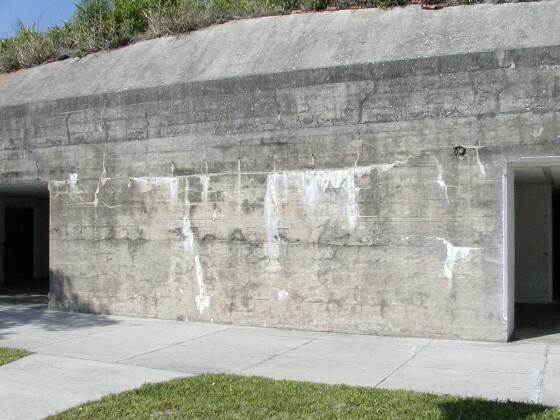 It is supposed to conduct water away from the top of the fort, over to the sides, and into downspouts and channels designed to handle the runoff. The trouble is, after a hundred years, the drainage system has silted up. Naturally, when the intended drainage paths are choked up, water finds alternate routes! When you look at the walls of the fort in the mortar pits, and you see all the signs of water seeping out of the walls at random places, that's telling you that water has gotten behind the wall in ways that were never supposed to happen. Everything exposed to the weather is under attack. The solution is to remove the dirt, repair the drainage system, including the use of modern materials that will not choke up as easily, and replace the dirt. The benefits are twofold: first, and most obvious, you stop the damage which is accelerating and which will become more and more significant! Second, if the rooms in the fort, underneath this drainage system, are not "under attack" from water, they will become useful for display purposes. Water goes down behind the wall, then leeches through a joint; as we can see, over time, the water carries material out of the wall.